This poem was created by Emily Hinshlewood. All of the lines in the poem were responses to her questions on climate change from people she met as she walked across Wales. the Houses of Parliament tip, then capsize. 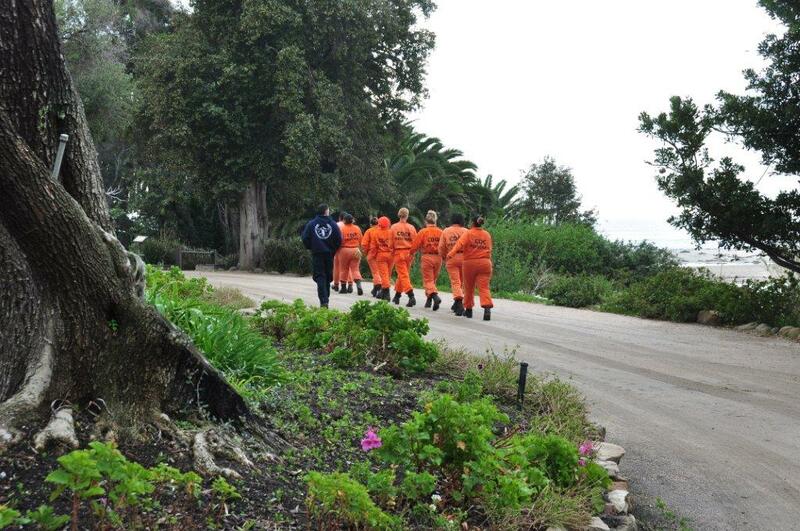 A female fire crew from a Malibu penitentiary is on its way to work in the park of Adamson House in Malibu, California. Wildfires regularly rage through this part of California and the inmates are involved in brush clean-up, felling trees, weeding, and the clearing of roads. Firefighting is typically a male domain in the U.S., but several “nonviolent female prisoners” are involved every year in Malibu with fire prevention and firefighting. In my own wrap up to the book I argue that, despite the many disagreements about the film, there are important truths in the film’s central themes, namely, that the spread of what we call civilization (first agricultural, later agro-industrial) has inexorably led to the destruction of both biological and cultural diversity. This is a reality that is seldom expressed in any nation today, for they are all wrapped up in pursuing economic growth with little concern for the damage this entails for peoples at the social margins let alone other species and environmental systems. Click here to read the entire interview – highly recommended! For the past few years I have been working on the global history of national parks. It has been a time of fruitful research. But why national parks? Why did I choose that topic? In fact, it was not me that chose the topic; rather, the topic chose me. 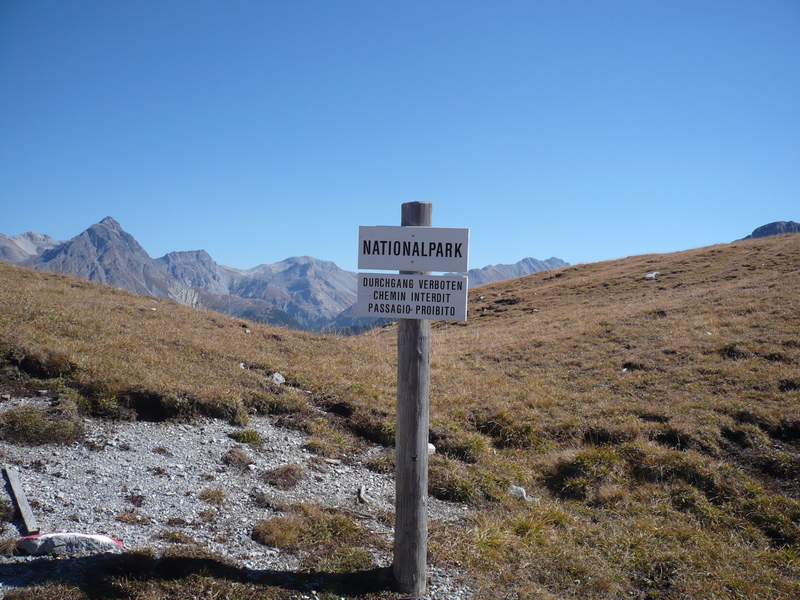 National park history first approached me in the spring of 2006 in the person of Thomas Scheurer, secretary of the Swiss National Park’s scientific research commission. Thomas wanted to discuss the possibilities of investigating the history of the Swiss National Park. The background was the park’s centennial forthcoming in 2014. Thomas was exceptionally forward-thinking—in 2006 the centennial was still eight years away! By being well ahead of the celebration, he wanted to make sure that the investigation was independent, based only on scientific rationale, and not constrained or directed by any needs for representation or popularization. Such a scientific approach seemed all the more appropriate as the Swiss National Park (unlike other national parks) had been driven by research throughout its history. Park research, however, had been concentrating on the sciences; the humanities had barely been involved and historical investigations were lacking. Sign in Swiss National Park. Photo: Patrick Kupper. It’s hard work being an environmentally-conscious American citizen in the twenty-first century. How can one source green guns? Is it an environmentally-sound decision to have children? And how far is too far for Little League? Such questions can overwhelm the good-hearted, CSA-loving eco-warrior. Fortunately, Carson Fellow Jenny Price writes an occasional advice column addressing just these issues. Click here to read expert advice that is guaranteed to guide you through the maze of responsible citizenship. For instance, have you considered that if you have children, you will probably die sooner of stress and sleep deprivation-related maladies, thus relieving the strain on our overburdened planet? 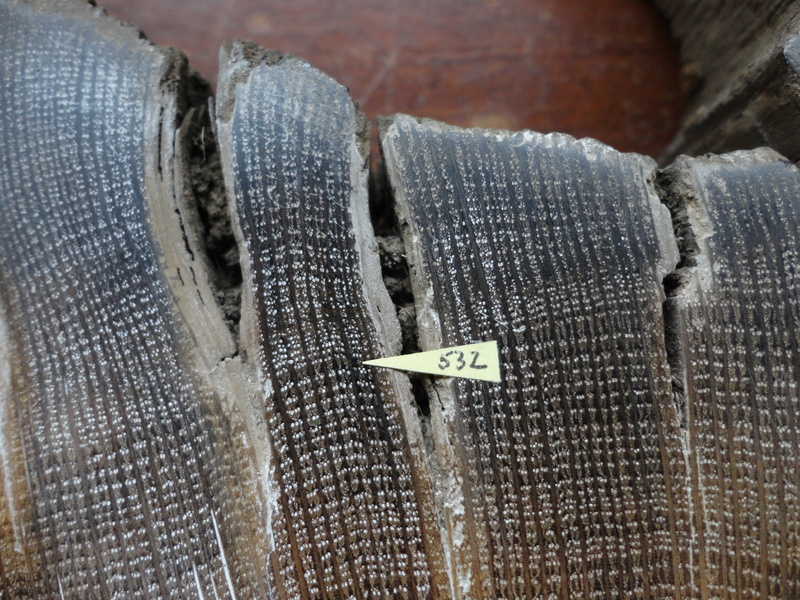 These images show a piece of ancient Irish oak wood, in which the ring-widths can be counted and measured for size. 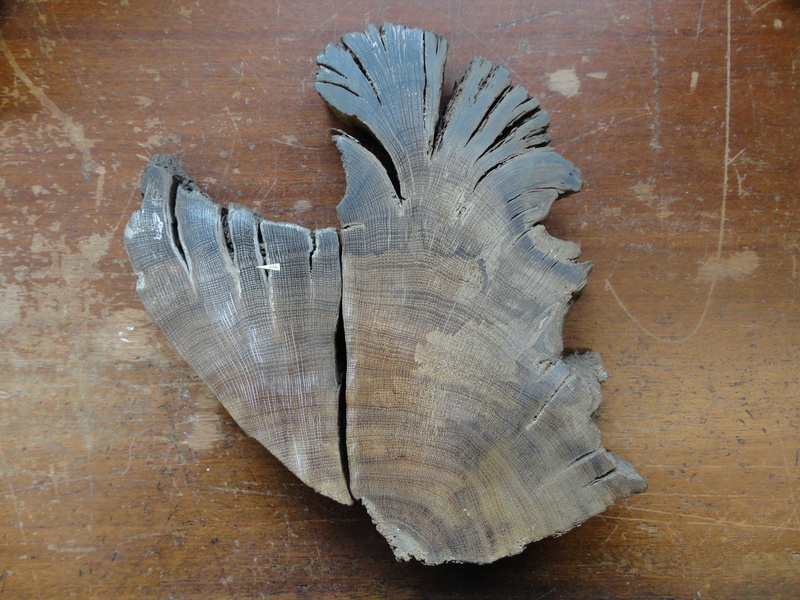 Bigger size equals better growing conditions, and this piece of wood happens to span one of the most famous episodes of extreme climate globally in the past two millennia, occurring from c.536-550 AD. There is an ongoing debate about whether the event was caused by a massive volcanic eruption and/or a comet loading the Earth’s atmosphere with particles that reflected incoming light and dramatically cooled the Earth’s surface. In the image, the year 532 is marked, in which the tree grew very well. But starting shortly afterwards (and especially from 536) you can see how the rings become narrower and narrower, and even become difficult to see. This reflects the environmental downturn that was in progress globally at this time, and which has been linked to famines and mortality in written sources from Ireland to China. One report in early medieval Irish chronicles for 538 notes a “failure of bread”. That this event was noted at all at this early period of Irish history, when written records are very scarce, suggests the seriousness of the conditions experienced at the time. This image also reveals the environmental background against which the great sixth-century plague of Justinian occurred. We thank David Brown of Queen’s University Belfast for permission to photograph this oak sample. Clapperton Chakanetsa Mavhunga is an assistant professor at the Massachusetts Institute of Technology (MIT). He works on the history of science, technology, and society in Africa. He was a Carson Fellow from July until December 2011. This video is part of a series of RCC Profiles. To view more videos from the series, please visit our YouTube channel. 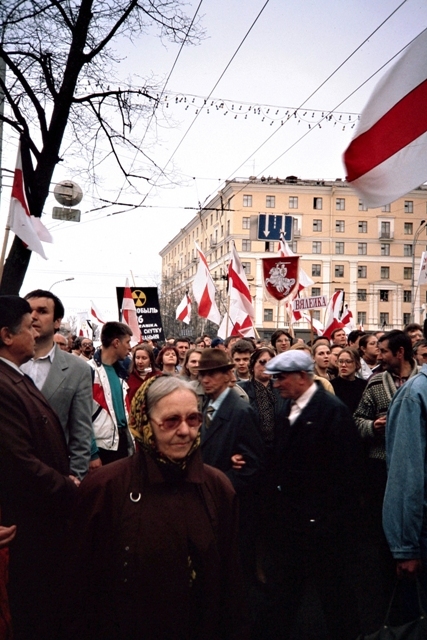 The “Chernobyl March” in Minsk, Belarus, on 26 April 1996, the tenth anniversary of the Chernobly disaster (photo by author). Thanks to the Rachel Carson Center, I was able to attend the ASLE-UKI (Association for the Study of Literature and Environment, UK and Ireland chapter) conference last month at the University of Surrey in Guildford, England. As a regular attendee of the main ASLE conference—which brings hordes of fleece-and-sandal-wearing professors to US and Canadian locations every other year—it was a special treat to explore literature and environment issues in a more intimate context. I was particularly excited to encounter innovative ideas and approaches such as Tonia Raquejo’s concept of “sound-landscapes” and Isabelle Hoving’s ecocritical readings of Japanese animation. Poetry and poetics were particularly well-represented at the conference, as was the crucial new concept of the “Anthropocene,” and an interest in water—perhaps a sign that the so-called “blue cultural studies” (Steven Mentz) is well underway.